As we all know, a vital ability in life is to respond creatively to an unforeseen threat quickly and decisively. 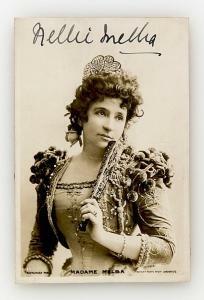 The great Australian diva, Nellie Melba, was set to sing Rosina in The Barber of Seville in San Francisco in 1898. Nothing unusual about that. It was one of her regular and best roles. The problem was that the opera is set in Spain and, at that moment, Spain was threatening to invade and lay claim to Cuba. War appeared imminent and anti-Spanish feeling in the USA was running high. At the performance, although Melba herself was treated courteously by the audience, the barber, Figaro, was roundly booed. It so happens that in Act 2 there is a singing lesson where the composer, Rossini, allows Rosina to perform a song of her own choosing “ad libitum”. In San Francisco, the piano was pushed on stage, and Melba, a fine pianist, accompanied herself singing one of America’s favourite songs of the day, Stephen Foster’s “Old Folks at Home”. And, when the applause had died down a little, she followed up immediately with “The Star Spangled Banner”. A local reporter noted: “People rose in their seats and cheered themselves hoarse.” The audience wept – the diva with them. Problem solved. If you’re a SOTH subscriber following by email please go to the actual blog to get the full posting. This entry was posted in 1898, Uncategorized and tagged cuba, diva, figaro, nellie melba, old folks at home, roger neill, rosina, san francisco, spain, stephen foster, the barber of seville, the st, the star spangled banner, usa by Nipper. Bookmark the permalink.